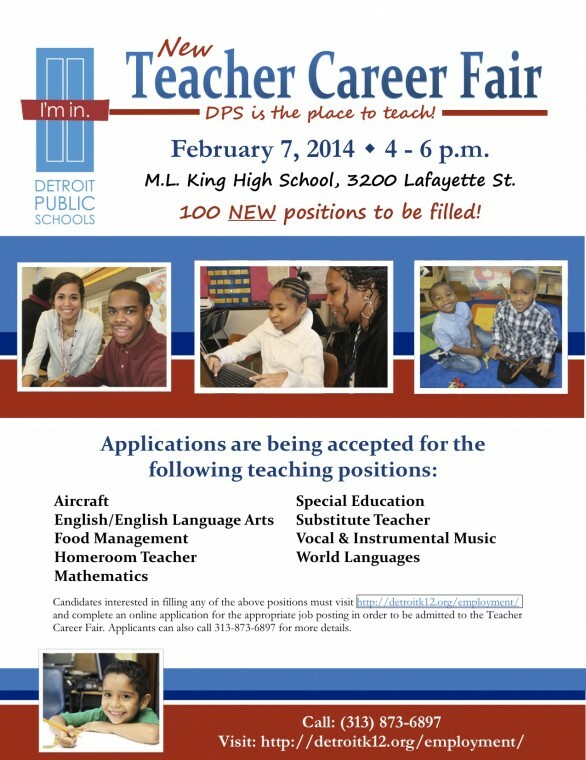 Detroit Public Schools has nearly 100 new teaching positions open with opportunities for immediate placement. 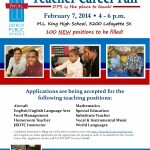 To help fill the spots, the district is hosting a Teacher Career Fair on February 7, 2014 from 4-6 p.m. at Martin Luther King, Jr. Senior High School, 3200 Lafayette St. Supporting a commitment to offer high-quality instruction at all grade levels, the teaching positions will build upon the district’s current talent acquisition pool. 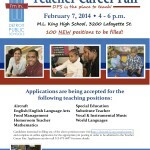 A majority of the positions will be funded by additional Title I grant funding from the Michigan Department of Education. Among the available teaching positions are those for vocal and instrumental music instructors, which align with a key initiative of the district’s new 5-year Strategic Plan—bringing arts or music programs back to all DPS elementary/middle schools. Candidates interested in filling any of the above positions must visit https://dpscd.detroitk12.org/employment/ and complete an online application for the appropriate job posting in order to be admitted to the Teacher Career Fair. Applicants can also call 313-873-6897 for more details.